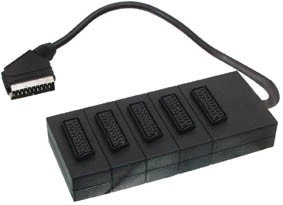 Scart Splitter 5 way. Allows up to 5devices to be connected at the same time. (Example TV, DVD, DVD-R, Sky-box, Freeview, Games, VCR etc etc.) Nickel plated contacts. All 21 pins connected. 300mm Cable.